September is my garden tally month. You know, walk around the gardens, peruse the flowerpots, and then takes notes. Hmmn ... which plants thrived and which ones are going to be pulled and tossed into the compost pile. Perennials ... well, they'll just have to tough it out. They will stay put. This year's annuals? The scraggly ones will be the first to go. Most annuals I classify as the unfortunate ones. Their only job is to sit there and look pretty all summer. By the time September rolls around they've pretty much bloomed themselves to death. This year in my garden such is the fate of six clumps of dried out lobelia, five annual salvia plants with no flowers, a few pots of snapdragons with only a handful of buds, and some fading zinnias in a window box. Now, on to the real failures. 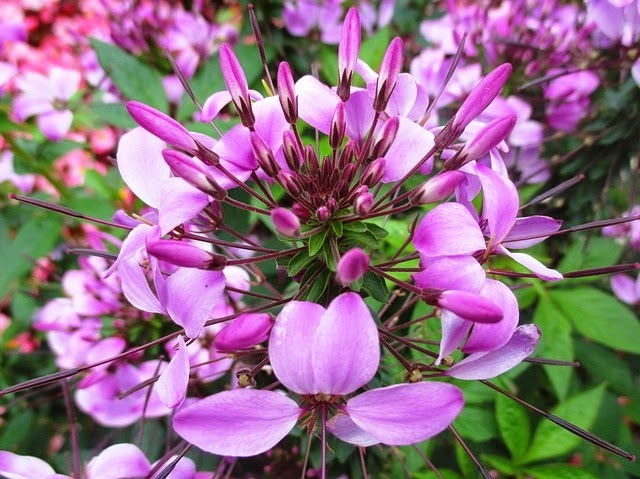 Pictured above is Cleome, also known as the Spider Flower. It's a beautiful, tall exotic looking flower that's a real stand out in the garden. At least ... it usually is. Pictured above are my poor little Cleome plants. Not enough heat. Not enough sun. No flowers. Bugs and deer, and groundhogs. Oh my. Another failure for me was Nicotiana Sylvestris or flowering tobacco pictured above. It's a tall, strikingly beautiful ornamental plant with large, oval leaves. It produces large clusters of fragrant tubular flowers. I started with about two dozen home grown seedlings and was left with four nice sized plants growing happily in my garden. Slow growing at first, but they began to take off in July. Then August came ... and so did the hungry wildlife. As you can see, most of the foliage has been chewed. I did have flower buds forming, but they were eaten as well. My biggest disappointment this year are my black-eyed susan vines, Spanish Eyes. Lush foliage, bright green leaves, but no flowers! Not a single bud! Maybe they don't like coir pots? I dunno. Now take a look at the photo above. These were my black-eyed susans, Spanish Eyes, that I grew in a large pot on my back deck a few years ago. They were spectacular! Anyway, there is one annual that is tough as nails! 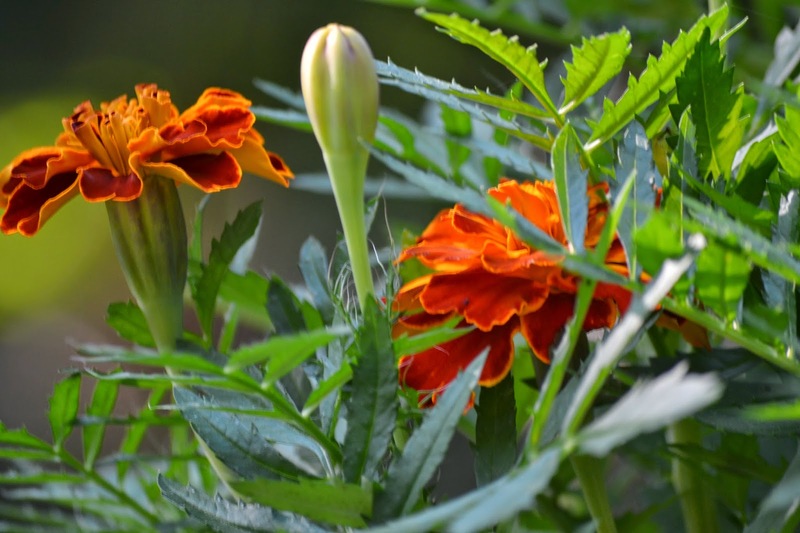 Marigolds are showy, colorful, and very hardy. Critters don't really bother them and they are natural insect repellents. They come in varying heights to suit any gardener's needs. They are among the first annuals for sale in early summer, but they are very easy to grow from seed. Do you want to really know the reason why I love them so much? Their longevity. They will continue to bloom their heads off right up until the very first hard frost! For me, that's nearly November! What's not to love!